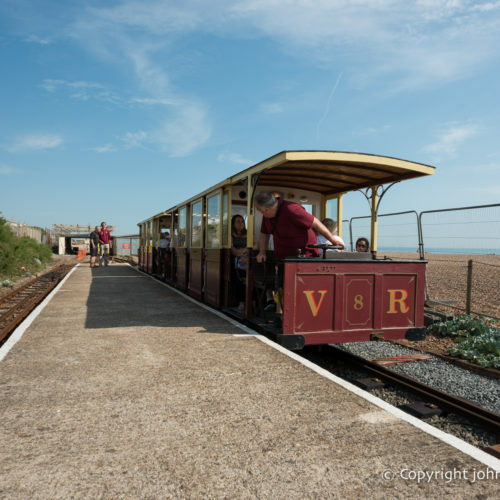 Volk’s Electric Railway runs alongside the beach from the Visitor Centre to Black Rock Station, with a further station halfway. The Visitor Centre is located in Aquarium Station, south of Sea Life Brighton on Madeira Drive and approximately 300 metres east of Brighton Palace Pier. Black Rock Station is 5 minutes walk from the shops, cafes, restaurants and attractions of Brighton Marina. The train Workshop is located near Halfway Station, next to Peter Pan’s playground. Tickets can be purchased at any of the three stations. Trains on the Railway. Image © John Fox Photography. Visitors to Volk’s will have the first opportunity to see its new Station & Visitor Centre with trains running every 15 minutes. View of the Railway. Image © John Fox Photography. A return journey along the seafront takes 25 minutes, and passengers are welcome to get on or off at any of the 3 stops along the route. A family spotters guide is available, which can be used either on the train or on foot. The trains can accommodate folded pushchairs and folded wheelchairs. Dogs are allowed. Download our Visual guide for Volks Railway to prepare for your journey. The journey from Aquarium Station to Black Rock Station takes 12 minutes. The journey from either station to Halfway takes approximately 5 minutes. The stations are accessible by wheelchair and pushchair. Wheelchairs and pushchairs must be folded to fit on the trains, or left on the platform at Aquarium Station (at owner’s risk).There is an accessible toilet in the Visitor Centre and accessible public toilets close to each station. An induction loop is in operation at the Visitor Centre and at Black Rock Station. Dogs are allowed on the trains, but need to be kept under control and away from the sides of the carriages for their own safety. The Railway is owned and managed by Brighton & Hove City Council. The recent redevelopment and refurbishment work was funded by the Heritage Lottery Fund, with some additional support from the Council and the Volk’s Electric Railway Association (VERA). How old are the trains? The trains are made up of different carriages, known as ‘cars’. Cars 3 & 4 were built in 1892. Car 3 was recently restored by the Volk’s Electric Railway team, and Car 4 has been restored by Alan Keef Ltd as part of the 2017 Heritage Lottery Fund project. Cars 6, 7 & 8 were built in 1901. Car 6 has been restored by Alan Keef Ltd as part of the 2017 Heritage Lottery Fund project. Car 9 was built in 1910. Car 10 was built in 1926 and has been restored by Alan Keef Ltd as part of the 2017 Heritage Lottery Fund project.